Win a World of Final Fantasy Collector's Edition on PS4! 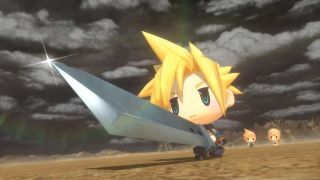 World of Final Fantasy is out on Friday October 28 on PS4 and Vita and to celebrate, thanks to Square Enix, we've got three copies of the PS4 Collector's Edition to give away to UK readers. Now fully sold out online, this shiny box is exclusive to the Square Enix Store includes the game on PS4, original soundtrack, special 80-page hardback art book and a set of three adorable mini figurines. To be in with a chance to win, just answer the following question in the comments below. Remember, for us to contact you once the competition is closed, you'll need to register or log in before you comment. The competition closes at 12:01am on Sun November 5. Good luck and don't forget this is only open to UK readers.